When I sat down with Katelyn during my coaching session, I had a few things in mind I knew I wanted to talk about: blogging being the most prevalent. It’s a tool I have been using to grow my business, typically in the form of sharing my clients’ stories and images. While I love sharing about my families, and of course my job is to take their pictures, I knew I wanted my blog to serve a greater purpose, and I knew Katelyn would be the one to light a fire under me to really get things going. Birth Photography is still a relatively new thing, it’s not common everywhere, and 75% of the time when I tell people what I do I get a puzzled look and usually a motion towards the general area of the body babies grow. Because I love what I do so much and I am so passionate about it, I knew I wanted my blog to serve as a place where photographers who are interested in shooting births as well as moms and soon-to-be moms could find information, ask questions, and learn about birth photography. This idea, however, needed a stepping-stone. I asked Katelyn (who has been a pioneer for sharing information through blogging and educating in the wedding industry) exactly how I was supposed to get started. She was probably the first person to tell me ‘its just as easy as sitting down and having a conversation with someone and sharing your knowledge that way.’ Light bulb. 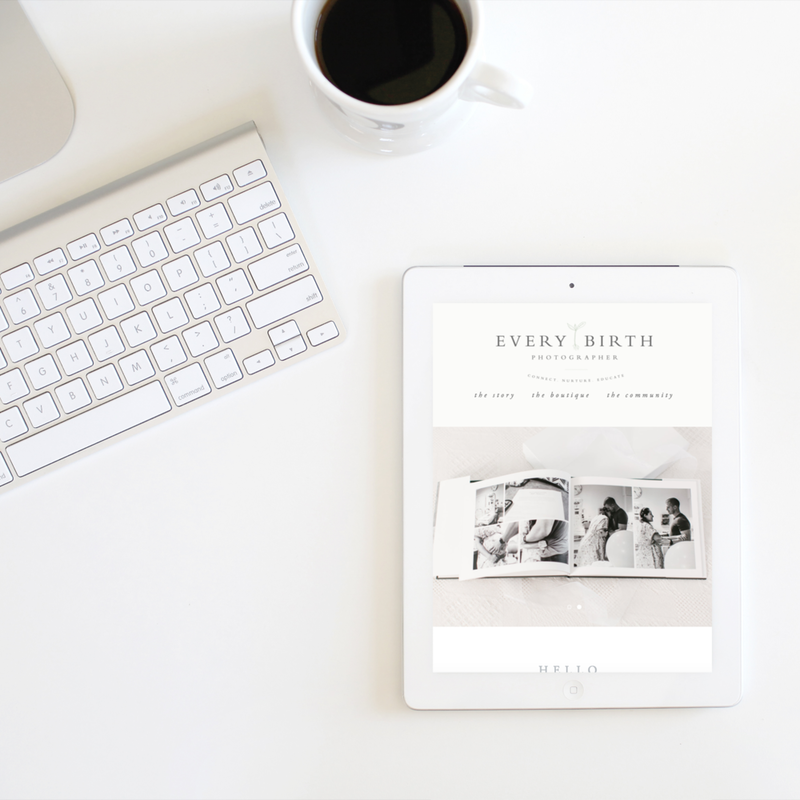 For whatever reason I have no issue telling people about birth photography, educating my clients when I meet with them, and explaining to friends what I do, but when it comes to writing it down in the form of a blog, I thought what I was sharing was no longer credible. Not true. I was just telling myself that what I wrote wouldn’t be as credible as what I said and I had to make a choice not to let that get in my way anymore. So, the real stepping-stone to sharing really begins with my story, the “how did you become a birth photographer?” question. Let me start from the beginning. Growing up, birth was normal. I was the youngest of 7 kids and my mom was a labor and delivery nurse. She took care of laboring mamas and helped them bring their little ones in to the world. While she never came home and shared details of her patients’ stories, I knew birth was a normal, everyday occurrence, which sometimes kept my mom at worker later than she was scheduled. Mom loved her job and worked for 43 years helping deliver babies, so there was no doubt she was passionate about what she did and I knew that. Fast-forward a few years to high school when I started taking photojournalism and learned how to work a camera. WOAH. This is what I want to be when I grow up I thought! I then quickly told myself it would never work out and I should get a real job. So off to college I went, with a Nikon D40 as my graduation gift, since I still wanted to have a camera to “play” with. I studied Early Childhood development and Elementary Education, going on to earn my Masters in Teaching because I truly loved working with little ones. As I started grad school one of my brothers and his wife were expecting, so I brought my camera with me to their baby shower, and then again to take some newborn photos after my nephew arrived. Then it was my sister’s friend who needed photos, and then another friend. Before I knew it I was spending any spare money I had on investing into my photography journey. Once I graduated, I decided to take the leap into the business world, obtain a LLC and make things official. From there my business slowly started to grow and I began to follow other photographers. I reached out to photographer Liz Cook, who had shot some friends’ weddings. She graciously accepted my invite for coffee and gave me so much insight into running a business. Fast-forward another few years and my same friend Liz had started to share birth stories on her blog. I found myself extremely intrigued by birth photography. I started to search for and follow more and more birth photography blogs and follow less and less family photographers and wedding photographers. Clearly my interest was sparked. When one of my longtime friends, Danielle, and I were catching up, she asked me if I had heard of birth photography. She was pregnant with her third baby at the time and told me how she wished she had it with her first two. I expressed my interest and that I wanted so badly to try it out. She offered to be my guinea pig in exchange for any “decent” images I may take, because let’s face it, shooting a birth is about the equivalent to shooting in a dark closet with no windows or lights! At this point I had never seen anyone give birth so who even knew if I was going to be able to keep my composure or keep from fainting. Danielle gave birth to sweet baby Harbor on May 28th 2014, and I will likely never forget any detail from that very first birth. I was totally in love with the entire process- before, during and after. I loved talking with Danielle in the final days before she became a mommy to three and being on call waiting for Harbor’s arrival. I loved seeing the excitement on her husband’s face when he got to hold his second baby girl for the first time. I loved being able to relive those moments as I processed each image and loved being able to deliver her those memories shortly after they arrived home from the hospital. I was totally hooked from being on call, being in the delivery room and a part of the birth team, to delivering the images to Danielle’s family and knew I needed to gain more experience shooting births before I actually started to offer any birth photography packages and decided to officially start the portfolio building process. If you're a photographer and considering offering birth or if you're just wondering how I built my portfolio, come back next week to find out what step to take next! Disclaimer: I am not a doctor, nurse, midwife, doula or childbirth educator. I do not give medical advice in any way. If you are seeking information from any of the above listed, I would be happy to provide resources or contact information to those who can provide the resources and information for you.